15 years ago today, Dandy was very pleased to have Flopsy Girl back home with him. Well I am very pleased to say that I now have my Flopsy Girl back where she belongs. She's still a bit woozy, and is not eating properly yet, but at least she is at home with me again. To be honest, I had not realised how upset the whole business had made me. I'm off my food a bit (CAN YOU BELIEVE THAT!) and my tummy is gurgling, still, I'm not blown up, so the 2-foots have not made me take any medicine. Yesterday, the 2-foot with no fur on the top of his head stayed at home with me all day. It was nice to have some company, although it's hardly the same as having my Flopsy Girl there. 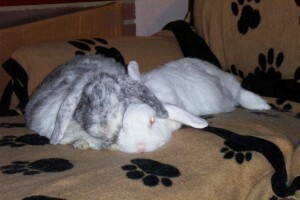 Today, the other 2-foot is staying at home with me and Flopsy Girl, so we should have lots of attention today as well. Oh bless my dear. Have a lovely day together all of you.